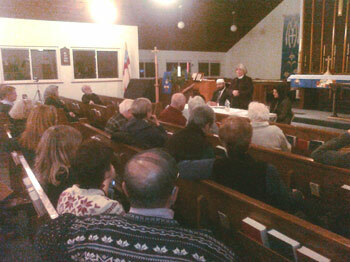 A panel organized and moderated by Lisa Greene was held at Allendale Trinity Church on December 8, 2010 between 7:30-9:30pm. 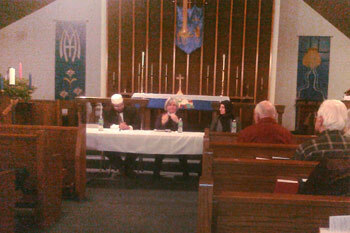 Two panelists - Imam Mohamed Al-Filali of Passaic Islamic Center and Nuray Sonmez from the IDC- were invited to speak about Islam in general, and some hot button topics like terror and pluralism in Islam. Questions and Answers followed the program. In conclusion, the importance and necessity of Tolerance and Dialogue was stressed for a peaceful world. A song about peace was sung together. 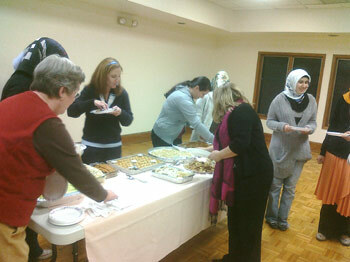 The night proceeded with delicious Turkish refreshments brought by the IDC members. The two communities expressed their feelings of gratitude to have met each other and to have shared such a great evening together.